On the way to the FOMC´s two day meeting, April 26 and 27, there has been much talk about the lack of power of monetary policy to get the economy going. My last post indicated that there was “an untapped power” of monetary policy that could still be harnessed. Notwithstanding the fact that the policy rate is near its zero lower bound, the Federal Reserve retains a number of tools and strategies for providing additional stimulus. I will focus here on three that have been part of recent staff analyses and discussion at FOMC meetings: (1) conducting additional purchases of longer-term securities, (2) modifying the Committee’s communication, and (3) reducing the interest paid on excess reserves. I will also comment on a fourth strategy, proposed by several economists–namely, that the FOMC increase its inflation goals. A first option for providing additional monetary accommodation, if necessary, is to expand the Federal Reserve’s holdings of longer-term securities. As I noted earlier, the evidence suggests that the Fed’s earlier program of purchases was effective in bringing down term premiums and lowering the costs of borrowing in a number of private credit markets. I regard the program (which was significantly expanded in March 2009) as having made an important contribution to the economic stabilization and recovery that began in the spring of 2009. Likewise, the FOMC’s recent decision to stabilize the Federal Reserve’s securities holdings should promote financial conditions supportive of recovery. I believe that additional purchases of longer-term securities, should the FOMC choose to undertake them, would be effective in further easing financial conditions. However, the expected benefits of additional stimulus from further expanding the Fed’s balance sheet would have to be weighed against potential risks and costs. One risk of further balance sheet expansion arises from the fact that, lacking much experience with this option, we do not have very precise knowledge of the quantitative effect of changes in our holdings on financial conditions. So has QE2 accomplished what most reasonable onlookers expected? I think it’s fair to say that it has, and I think it’s clear, in the light of these realised expectations, that QE2 was a very good thing to have. Asset purchases were designed to improve economic conditions relative to what would have otherwise prevailed. And Mr Appelbaum doesn’t come close to arguing that the policy failed on this count. Bernanke is a “credit channel freak”, so he puts much emphasis on “lower rates”. But let us look at what happened in several dimensions after QE1, after QE1 was ended, when QE2 was “hinted” at on August 27 and following implementation on November 3. If QE2 is successful, then we would expect treasury yields to rise! 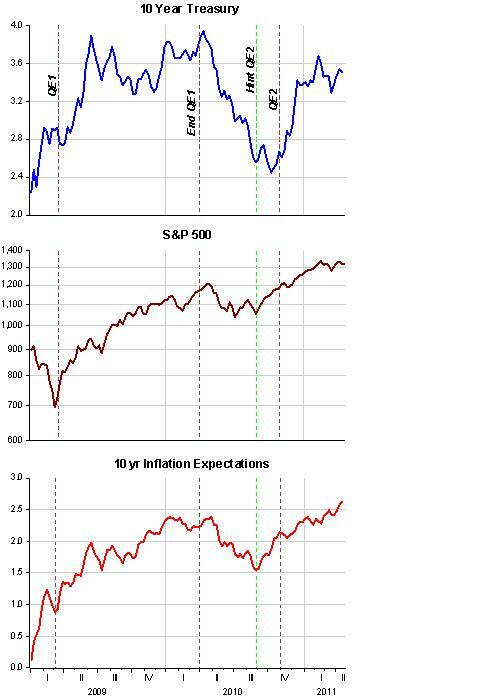 A successful QE will first raise inflation expectations. This alone will put upward pressure on nominal yields. However, expectations of higher inflation are in effect expectations of higher nominal spending. And higher expected nominal spending in an economy with sticky prices and excess capacity will lead to increases in expected real economic growth. The expected real economic growth should in turn increase real yields. It is that simple. It has been frustrating to watch the Fed sell QE2 to the public as working through the lowering of interest rates. This marketing of QE2 creates the false impression it will only work if yields remain low. It gives critics of QE2 more ammunition and ultimately undermines the effectiveness of the program. Stocks went up after QE1, fell when it ended and resumed the up trend with “hints” of QE2. The same happened with inflation expectations (a sign of future higher nominal spending). 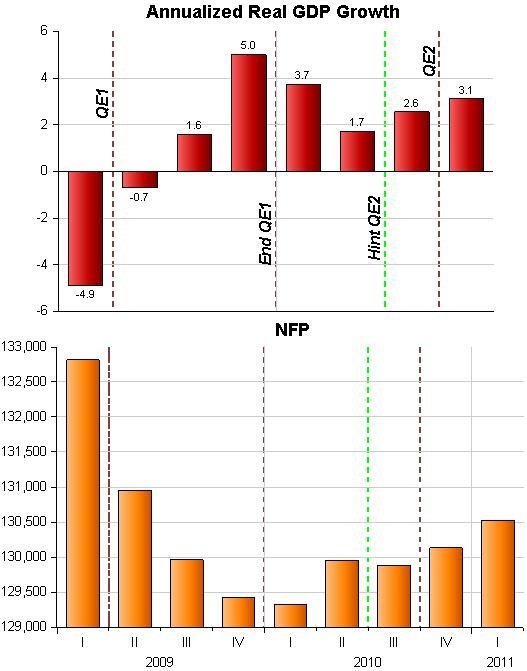 The second block shows real variables: Real annualized growth and non-farm employment. A case can be made that the QE program was helpful in giving some boost to growth, but employment was not much affected at all, and that´s probably the main reason why QE2 is perceived as a “disappointment”. Unfortunately, the Fed didn’t set a policy target. Instead it opted for the $600 billion figure, thereby inviting critics to judge the Fed on whether $600 billion was, in fact, the right action to take. Since the Fed didn’t establish what, exactly, it was hoping to accomplish with its $600 billion, in terms of an observable policy target, it left the door open for people to assume that it was doing what it viewed as necessary to make the economy work again. And if the economy isn’t quite working again, well, observers can be forgiven for experiencing some skepticism of the value of expansionary monetary policy. Maybe there´s hope. At the end of the coming FOMC meeting Bernanke will inaugurate the “news conference” to explain its decision to the public. That, I believe, could be the first step in implementing his point # (2) from the Jackson Hole speech – modifying the Committee’s communication. A second policy option for the FOMC would be to ease financial conditions through its communication, for example, by modifying its post-meeting statement. As I noted, the statement currently reflects the FOMC’s anticipation that exceptionally low rates will be warranted “for an extended period,” contingent on economic conditions. A step the Committee could consider, if conditions called for it, would be to modify the language in the statement to communicate to investors that it anticipates keeping the target for the federal funds rate low for a longer period than is currently priced in markets. Such a change would presumably lower longer-term rates by an amount related to the revision in policy expectations. Again, notice the focus on “low long term rates”. The Fed has to come to grips with the fact that this is not “business as usual”. A drop in nominal spending was last seen in 1938! You cannot talk (or communicate) about monetary policy as if nothing untoward had happened. It´s not just about “getting growth up a bit”. It´s about a very depressed LEVEL of spending! So please, in your “news conference” don´t indicate that “monetary stimulus” will end in June, when QE2 comes to an end. Come out and state a clear TARGET, not for inflation, because that´s useless and “dangerous”. The following pictures can help you define a good target. The first is a good indication of why, despite some growth, employment is still in the “toilet”. Note that while spending growth was converging to trend after the low spending growth of the early 2000´s, NFP was rising robustly. 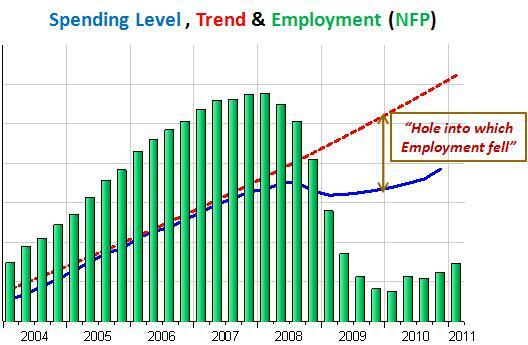 As soon as the nominal spending begins to falter, falling below the trend level, NFP stops rising and falls a little, dropping into a “hole” when spending “melts” after mid 2008. 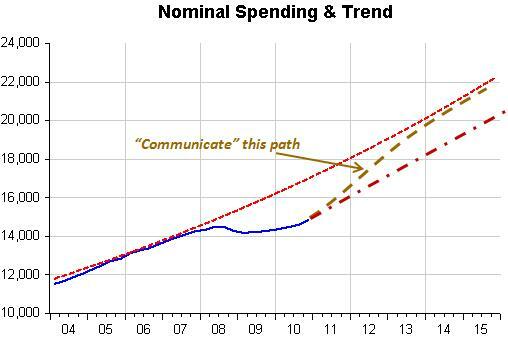 The last figure indicates what you have to “communicate” – a path for nominal spending that in a specified period of time will take you to a “reasonable” spending level path. Simply focusing on “trend growth” will continue to be “disappointing” because the “gap” will remain open! Many people are hurting since they may have substantial savings, but the Fed’s low interest rates are depriving them of millions, (possibly billions) dollars of interest income that could be spent to stimulate the economy. As a result, savers especially those on Social Security (who have not received a Cost of Living Adjustment for three years), are not spending as much, and this tends to slow the economy down.